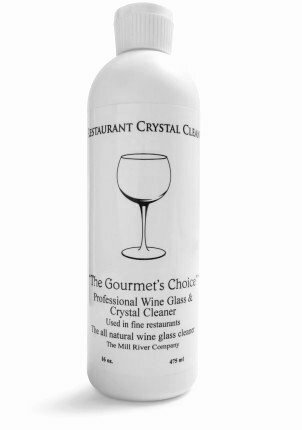 Restaurant Crystal Clean: Professional Wine Glass Cleaner and Crystal Cleaning Liquid -16 oz. Don't ruin your great wine with ordinary soap! Restaurant Crystal Clean is a professional quality, all-natural, plant-based, fragrance free wine glass washing liquid that does what it sets out to do: leave you with an absolutely pure, fresh, crystal-clean glass. The glass and stem shine will amaze you the first time you try it! Great wine glasses such as Riedel, Spiegelau, Schott Zweisel, Baccarat and Waterford are specially designed to bring out each and every nuance of flavor and aroma that our winemakers craft into our wines. Truly great wine glasses are what we use to enjoy every last drop of our favorite wines. Isn't it worth less than a penny per washing to experience cleaning wine glasses perfectly, and tasting your wines as your winemaker intended? This unique, all-natural, plant-based formula won't etch, pit or cloud your glasses, and leaves no chemical, scent, or soap residues behind. RCC removes grease, butter, olive oil, red wine stains, and lipstick. Makes any wine taste better in any glass. Restaurant Crystal Clean leaves nothing in your glasses or decanters to diminish your enjoyment of your wine or crystal. And it makes washing wine glasses perfectly easy. One 16 oz. bottle washes over two thousand glasses! This is the best wine glass cleaner on the market today. Used in top-tier wineries and glassware manufacturers all over the world. Bring this world-class quality into your kitchen or culinary establishment today! Is your ordinary soap or supermarket cleaning liquid tainting your wines with chemicals or residue? Give Restaurant Crystal Clean a try! Discounted for a limited time only! No film! No spots! No odor! No bitter tastes! No chemical aromas or aftertastes! Immediate Results, No Soaking. For handwashing or machine washing. Reduces polishing 97%. Prevents cloudiness. A quick wipe to dry is all you need. Also perfect for art glass and collectibles. Concentrated, 100% Biodegradable, No Preservatives, No Hydro-Carbons. As seen in The New York Times, The Wine Spectator, The San Francisco Chronicle. Used in top-tier wineries and glassware manufacturers all over the world. If you have any questions about this product by The Mill River Company, contact us by completing and submitting the form below. If you are looking for a specif part number, please include it with your message.